Jen Calonita. The Grass is Always Greener. New York: Poppy, 2013. 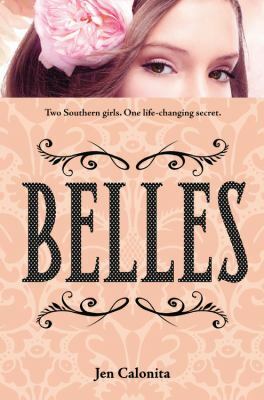 The conclusion to Jen Calonita’s Belles series finds half-sisters Mirabelle and Isabelle Monroe each facing her own crossroads. The Monroe family is used to an easy life, but that changed when Isabelle “Izzie” Scott (in reality Monroe) arrived. Hailing from the nearby struggling community of Harborside, the daughter State Senator and family patriarch Bill Monroe never knew existed has certainly made life interesting in the affluent town of Emerald Cove. No one has felt the changes more than Izzie’s half-sister Mirabelle. Originally a quiet conformist, Mirabelle has started to march to the beat of her own drum. She’s pursuing her own interests in painting, as well as a quirky, artistic boy named Kellen. Izzie has changed her life, but nothing is perfect. Kellen is moving away, and Mirabelle’s novice artwork faces harsh criticism from a teacher. Will she stay true to her newfound path? Although used to blazing her own trail, Izzie has trials to face as well. 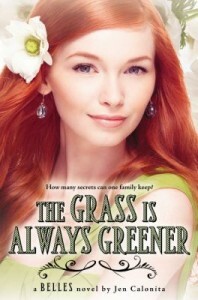 Shortly following the death of her beloved grandmother, an aunt Izzie never knew about arrives in town. Zoe Scott had a terrible falling out with her sister, Izzie’s mom, before Izzie was ever born. Now Zoe wants to make amends and take her niece away to live in California. Izzie isn’t sure if she wants her aunt in her life, much less if she wants to leave the Old North State. Additionally, Savannah Ingram, the alpha girl of Emerald Preparatory, looks ready to make Izzie pay for disrupting the status quo. Forced to work with the snobby queen bee on a project, Izzie is sure she’ll be miserable. But is Savannah really as bad as she thought? Torn between the lessons of her meager upbringing and the challenges of her new, shinier life, Izzie must decide what her future will hold. Both girls are about to turn sweet sixteen, and at this rite of passage they must decide who they will be. But since Isabelle and Mirabelle Monroe first accepted one another as sisters, one thing is certain– whatever they face, they’ll face it together. Jen Calonita. Winter White. New York: Poppy, 2012. Isabelle “Izzie” Scott is still adjusting to the revelation that her uncle, North Carolina State Senator Bill Monroe, is in fact her father. The Monroe family may appear polished and smiling for the media sharks during the Senator’s re-election campaign, but away from the cameras, they’re falling apart. Mirabelle, who at fifteen is only a few months younger than Izzie, is still not willing to forgive her father, and neither is Izzie. Their younger and older brothers are fine, but the girls refuse to have anything to do with Senator Monroe beyond their filial duty to uphold his public image. Meanwhile, mean girl Savannah Ingram, the queen bee of Emerald Prep, is on the warpath. Mirabelle, who used to be one of the most popular girls at Emerald Cove’s elite private school and Savannah’s best friend, is officially a persona non grata. Not only did she finally accept her strange and awkward half-sister as both a member of her family and a friend, but she didn’t help Savannah sabotage Isabelle’s burgeoning relationship with Savannah’s handsome ex-boyfriend, Brayden. 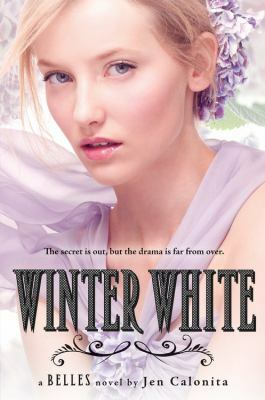 Worst of all, one of the most important events in Mirabelle’s life is fast approaching: cotillion, where every young girl in Emerald Cove who is anybody comes out as an official debutante. Contrary to everyone’s expectations, Izzie is also participating. Will the girls survive the demanding preparations designed to turn them into proper Southern belles? As the preparations for the debutante ball become more difficult, boy problems loom, and more bad press appears, so the girls must once again work together to save their family and their own happiness. Jen Calonita. Belles. New York: Poppy, 2012. Fifteen-year-old Isabelle “Izzie” Scott loves her life in Harborside, North Carolina: working as a life guard at the beach, hanging with her friend Kylie at the local ice cream shop, and swimming laps at the pool in her beloved community center. Orphaned at ten when her single mother was killed in a car crash, Izzie lives with her aging grandmother, and it’s a daily battle to convince her concerned social worker that Grams is a good enough guardian. Grams is slowly losing her grip on reality, and one day Izzie arrives home to find that a decision has been made without her: Grams is moving to an assisted living facility, and Izzie is sure she’s destined for foster care. But Grams has been hiding a secret from her. Unbeknownst to Izzie, she has a long-lost uncle: a wealthy state senator who lives with his wife and children in nearby Emerald Cove. Her uncle and aunt have agreed to take Izzie and raise her with their children, offering her all the best love and care and a first-rate education at the prestigious Emerald Prep. Harborside and Emerald Cove are only a few miles apart on the scenic North Carolina coast, but they might as well be on separate planets. Emerald Cove is home to some of the wealthiest families in the state, sporting boutique shops, sprawling mansions, and a refined country club, while Harborside is barely above a slum with its low-income housing, gang violence, and seedy boardwalk. Izzie’s aunt and uncle Monroe are welcoming, but her cousin Mirabelle, nearly the same age, is one of the most popular girls in school, and Izzie definitely doesn’t fit in her with her crowd. Worst of all, the gorgeous Savannah Ingram (Mirabelle’s best friend and the queen bee of Emerald Prep) takes a particular dislike to Izzie, and stirs up plenty of trouble for the new girl. Soon Izzie isn’t sure if she’s fighting to fit in or fighting to get out, but the true drama and scandal haven’t even begun. Reminiscent of Gossip Girl with a southern twist, Belles is the beginning of a fantastic new series about family, community, and fashion for young adults.